I am SOOO excited to FINALLY get to show you what I've been busy working on and what I've been dying to share. 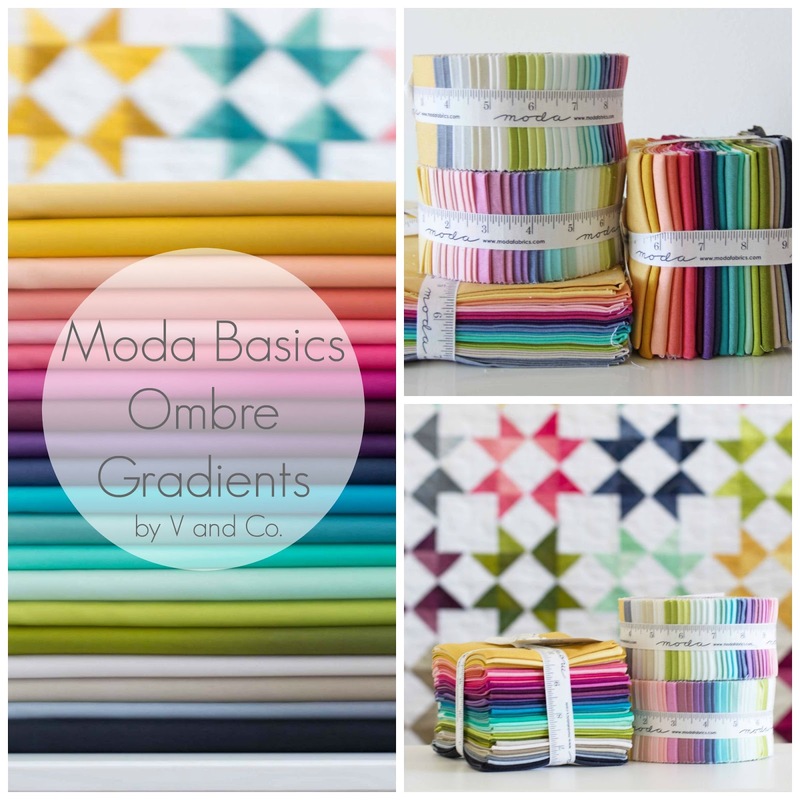 Introducing V and Co. Ombre Moda Basics. TWENTY colors of ombre. They will come for a limited time of pre-cuts of Jelly Rolls, Fat Quarter Bundles, and Half Yard Bundles. Yardage is of course also available...And well, because they are BASICS, that means if you are a Quilt Shop, and you run out of a color…it'll be there for you to re-order when you need to. make projects using all the fabrics together, or individually. Whatever is your fancy. Well, what can we say? Now you have lots of different options in colors!! What color would you make this Ombre Lonestar?? How about our Fadeaway pattern? What new colors would you pick for this one?? 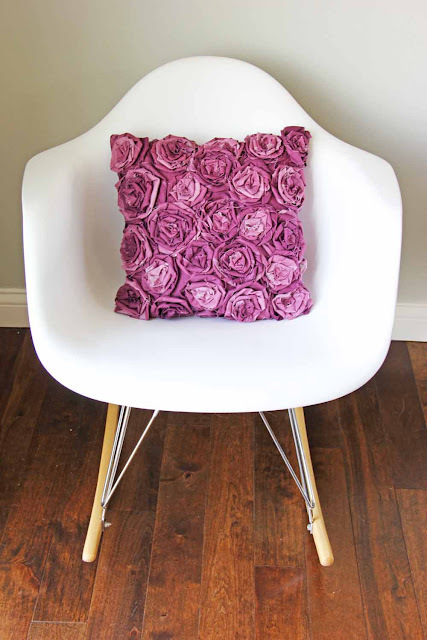 Or how about our Texture pillows pattern to make this rosette pillow using the ombre…um yes please! Check it. We've been super busy making MORE patterns just for these beautiful fabrics. we will continue to release more patterns in the coming months as well. So please keep coming back to see more and more patterns and projects made up in these gorgeous ombre gradient colors. So are you as excited as I am? I don't think it's possible…but seriously, I'm in love and I don't care who knows it. And well, I'm feeling extra happy and want to share. So Leave me a comment, saying anything you want really, for a chance to win a box full of these 20 colors of Ombre scraps. I'll pick a winner sometime this next week. When we debut our new patterns. Oh my goodness these are amazing! So in love! Congratulations! I'm excited - I was searching for your first ombres to make more baby blankets and then discovered that your simply colorful line had yardage. Now I have more colors to chose from - yea!!! Congratulations! What wonderful new fabrics. I can't believe you were able to keep quiet about them. I can't wait to try the new colors. I wanted to make the baby ombre quilt and now I'll have so many fabric choices. The new tote pattern....to die for! I can't wait to get started. Wow, more ombre colors. I love them and I'm really excited what will you create next. Yay!!! I'm glad there are so many colors and that they are basics!!!! I love the sneaks of the new patterns and textured pillow in purple/orchid is on my list! Amazing colors, and so many possibilities! I can't wait to get my hands on them!!! Love these! They are gorgeous! Another wonderful line! Your ombre's are always so beautiful, just love them. Looks like you have some great new patterns too! I can't pick colour I like best! They're all gorgeous! Sew Pretty. I love turquoise and Popsicle pink!! Wow, simply gorgeous. 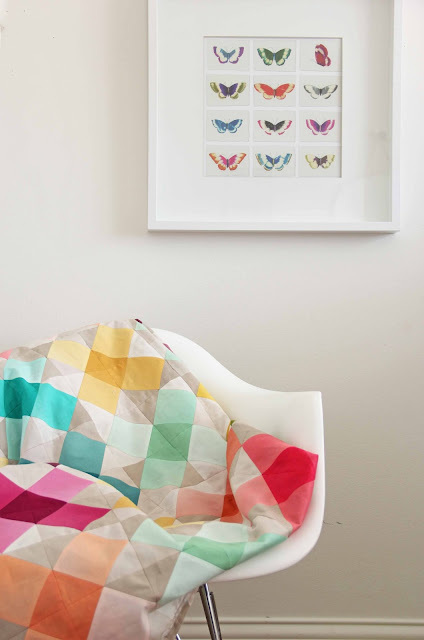 I'm loving that Secret Garden quilt! They're beautiful! Can't wait to work with them. Thanks for the giveaway! What beautiful colors!! Congratulations! And your new patterns look stunning with these fabrics!! Can't wait to see more! These colors are amazing! I can't wait to use them! I've been reading your blog for years and years, and I'm so impressed by your new ventures! Congratulations!! Lots of possibilities for lovely quilts. Oh, I love these, Vanessa! Well done! These are gorgeous, Vanessa! The options are endless...I think they'd make a beautiful Snippets quilt in addition to your patterns! Oh I love these ombre fabrics. I can't wait to make something of them! I can't wait to see crisscross applesauce. 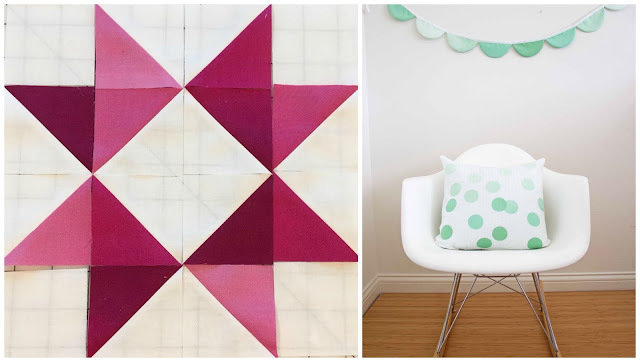 Your projects using these fabrics look amazing! 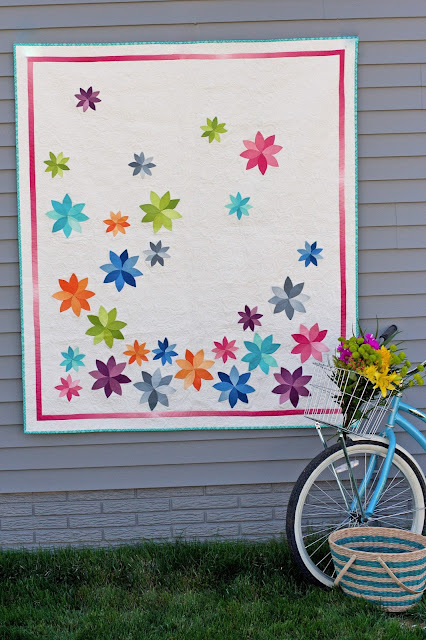 Love them all...I would love to make the Bloom quilt! I think I need to add these to my stash! I love it! I want to make the secret garden quilt! 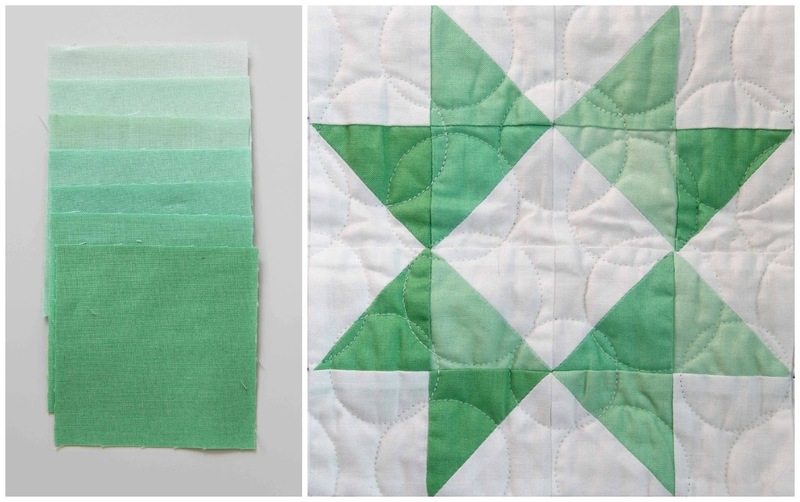 Oh I want to make that x cross applesauce quilt!!!!! Thank you! So pretty! That bag is too cute and the lone star quilt is gorgeous. This would look fantastic in your Lucky Stars quilt. This fabric will be so much fun to play with. This is perfect for a project I have been wanting to try. I can't wait to buy some! I could now make a hounds tooth quilt with every fabric but I do love your new patterns also. Thanks for all your awesomeness that keeps us great awesome stuff. Just fabulous, Vanessa. Can't wait to get these! These colors are gorgeous! Thanks for the giveaway. Fun quilts. Working on a solids one right now. It would be fun to add more to it. Oh I love all these colors!!! Can't wait!! This collection of colors is perfect! Getting to play with all of these ombres would be so much fun! I'm so thrilled with all these beautiful ombré fabrics! 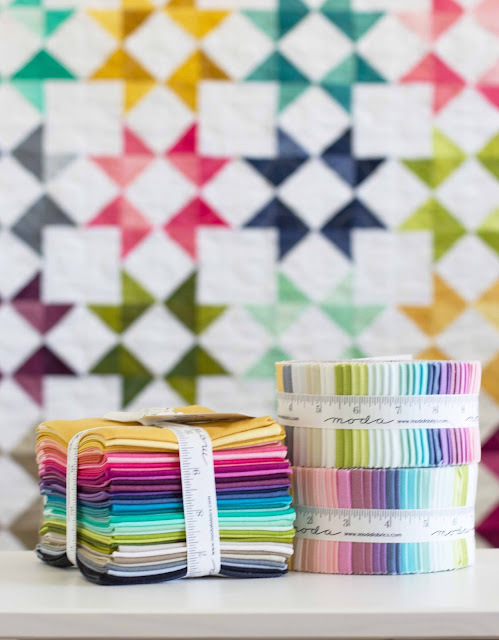 Very definitely will be working with ALL of these colors as soon as I can get my hands on them...it may sound weird, but I can picture a gorgeous log cabin with all these fabrics!! Love playing with the limited ombre palette you already released, so happy that these will be basics, gives me the confidence to cut in to beautiful fabrics when making things for other people when I know they can be more easily replaced! Oooh - one word - PHENOMENAL!! Love these fabrics but of course, my favorite is ANYTHING in the PURPLE family!!!! 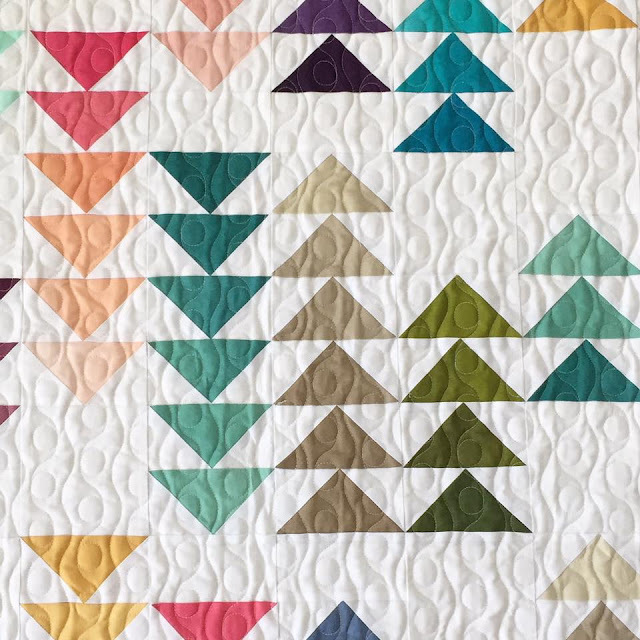 The Fade away quilt is beautiful. Here's my email address because I have to win (my husband will not let me buy anymore fabric lol. ajdeardurff@netscape.net. still anxiously awaiting my PURPLE book!!!! You've found such beautiful colors! These fabrics are gorgeous! Thank you for the chance to win! These fabrics are beautiful. Thanks so much for the chance to win!!! Love the new rush hour pattern. The colors are beautiful! You are so talented! Love these new fabrics! Hope everyone at you house has an easy transition back to school. They are beautiful. I cannot wait! Wow! 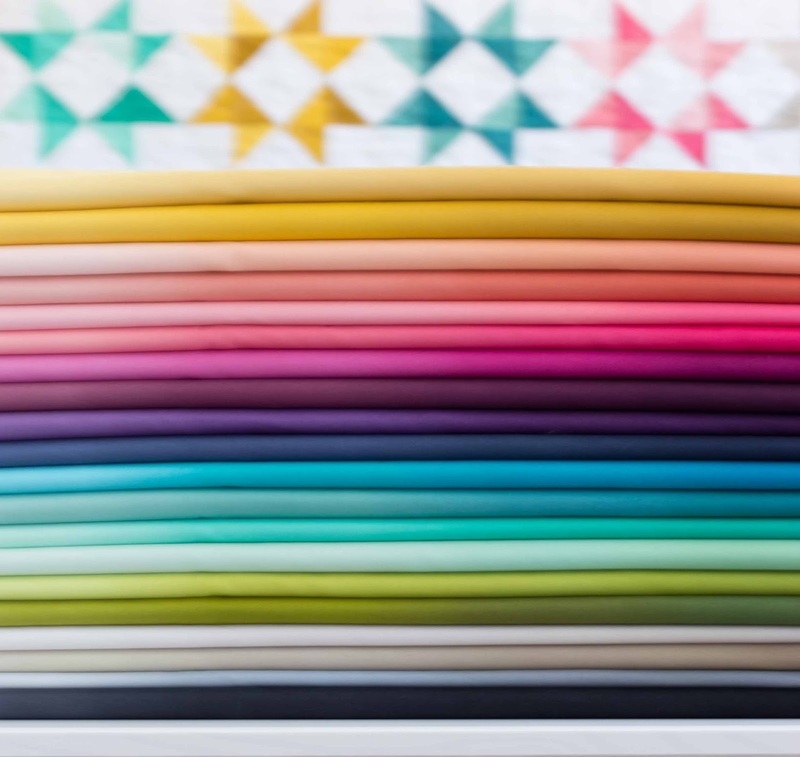 I'm loving these gorgeous ombre fabrics! I was drooling over simply color II waiting for them to arrive. Now I have more of your beautiful fabric to look forward to. Love it! These are gorgeous! There are so many possibilities! They are definitely going on my list if must haves for my stash. Thanks for the sneak peeks and giveaway. Beautiful colors! Love the Blog presentation, as it moves from one picture to the next as if to say, "Wait, there's more!" Wow, what beautiful fabric! Love it! This is better than Christmas! I love your Ombre fabric colors. I'd love to make the tote bag and the fadaway! Love, love, love these colors. I think the stars in the different shades are simply stunning. It will be hard to pick a favorite or even ten favorites! Great job! Those are soo pretty, I love the colors! congrats! these are so wonderful! Congratulations! The colours are stunning and I love working with ombre. It just adds a special touch. Very exciting! Some lucky person is going to be ecstatic! Oh my...ombre! Love it! Can't wait to see the new patterns, I will need to make a geometric tote ASAP! Thanks for a chance to win some ombre scraps! J9cj at optonline dot net! What a gorgeous palette.....would love to play with these! Such an inspirational collection. Thanks for keeping the bar high! Been waiting with bated breath for this day!!! It's a 2-day early birthday gift (& I believe I am getting the Red book on the actual day, per my request ��) just to see these yummies!! Too beautiful!! I am so excited to play with all these colors! That's great! I was worried the Ombres were going away and I'm not finished creating with them yet! Thanks. I love these colors! What a fantastic idea! Congrats!!! Those are gorgeous! Thrilled for you. I do hope that a shop in the UK is going to stock these on a permanent basis, they're fabulous! Vanessa! These are amazing! Congratulations!! Sew, sew fun! Yeah! That is fantastic news! So happy for you! I need to have access to these for the rest of my quilting life! They are genius. Thank you for the chance to win! Not sure my comment went through but these are so stunning! I'd love to win and I'm pretty sure I need to buy all of them to hoard and pet and enjoy the pretties. I'm gathering fabrics to make a surprise quilt of Valor for my husband. The plum, indigo, and turquoise will fit in perfectly with my color scheme. I would loooove some yardage of this. I'm thinking hexies! Love, love, love these Ombré fabrics! I want to make the stars and Criss Cross Applesauce. These are perfect! An excellent addition to the fabric world. Well done! This is so exciting. I'm such a sucker for ombre. Thanks for the chance to win a sample. These would be so beautiful in modern quilts. OH, oh, oh, oh, these are so pretty! The new colors are FABULOUS!!! I would love a box full of scraps.... I do mostly minis so scraps are perfect for me!!!! Oh my love these and would love to win! I'm so excited! I bought the ombre lonestar pattern as soon as it was released because I knew I had to make it for our spare bedroom. I'm still set on the pattern but haven't purchased the fabric yet because life has been too busy for projects lately and was starting to get stressed looking for it. I also LOVE the tote bag so I'm looking forward to that pattern and criss cross applesauce. You're a genius Vanessa! Thanks for the chance to win your scraps! Wow, love the ombre colors and the new geometric tote pattern. Thanks for sharing these goodies! Up all night with a sick baby=no fun. Ombré fabric=lots of fun!!! Wow, the fabrics are gorgeous and those patterns really show them off. Loving these so much. These are AMAZING! can't wait to see them all in person. I'm extra extra excited for the richer jewel tones in these ombres--they will be perfect for fall seeing! (Hollygetsquilty@gmail.com). Drooling just a bit! Have never done much with solids. Would love to start with these! Oooh you are a woman after my own heart!!! Loved ombré fabrics since the beginning of time!!! Have every ombré ever made (if I could get my hands on it), including some of your earlier ones. Love playing with them so much!! And now soooo many yummy colors - THANK YOU!!!! What a beautiful rainbow you've created! They're wonderful and it's really exciting that this time your ombre's will stick around for re-ordering. Love the colors and how using solid colors gives such a clean, simple look without being boring. OMG! Beautiful! I love, love, love these fabrics. Ombré love! This is a world of dreams...I know exactly what I would do with them. All hail the Queen of Ombre! These are gorgeous, Vanessa! What a fabulous collection. Congrats. I love ombres, you can create so many different looks with them and I am ever so delighted that they will now be basics. I neeeed these ombre scraps. So many possibilities! Congrats on this new line! I love all the colors-need to make a rosette pillow in each one! Yay! I am so excited for these! So excited about all of these colors!! Yay!!! Congratulations! These are fabulous! Oh the the ideas are spinning in my head right now. I just finished a baby sized version of Fadeaway using the original colors. Now I think I need to make a large one for myself using these colors! Beautiful! Love your colors! Thanks for the chance to win. Love these fabrics. So many possibilities. 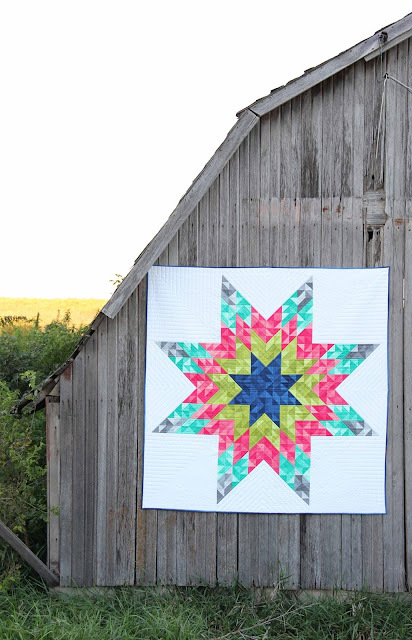 My cousin especially liked the star quilt when I shared the post on FB. Thanks for the great give away. Love Love Love this! Can't wait for it to come. I have so many projects I want to do with this wonderful fabric. I adore the fabrics...You just keep coming up with great lines....Can't wait to get my hands on these...So many project..sso little time. I love your ombré! It's so beautiful! I'd love to win the giveaway. congratulations on such a wonderfull line of fabrics! Oh my! These look delicious! What fun it would be to create something beautiful with them! These colors are amazing! And so are all the projects made from them. I look forward to getting some of my own to play with. Thanks! Wow! These fabrics are lovely, and it's wonderful that you have so many examples of how to use them. I want to learn! I can see that they can add additional depth to a quilt. They seem like they can be great focus fabrics or stash basics. Congratulations on persisting with your creative idea of ombre fabric and bringing so many colors to market. Happy, bright colors! Love them all, and liked your talk when you came to our guild in Marion, Ia. wow, so excited for your new fabric. my modern quilt guild group is going to love these. So pretty! 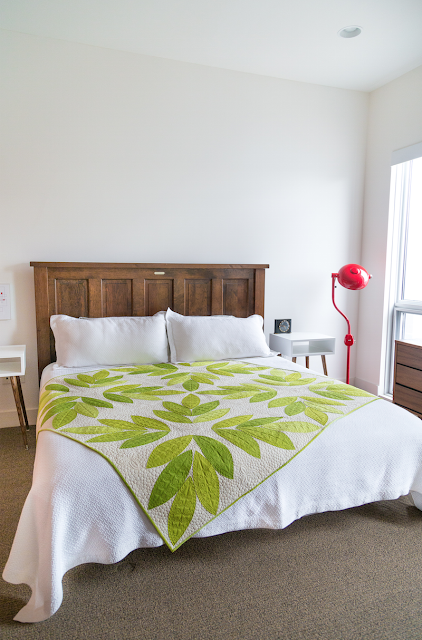 I want to make a lovely quilt for my bed. DH is finishing up our own farmhouse bed (Ana White style) and it'll need something gorgeous to set it all off. Thank you for the opportunity to win! Wow...these are just gorgeous! Would love to make that tote! Vanessa, you are a genius. These ombres are so awesome and I'm SO glad they are a basic! i don't have time to sew but it is always good to hoard fabric for when there is time. These are just too gorgeous for words! 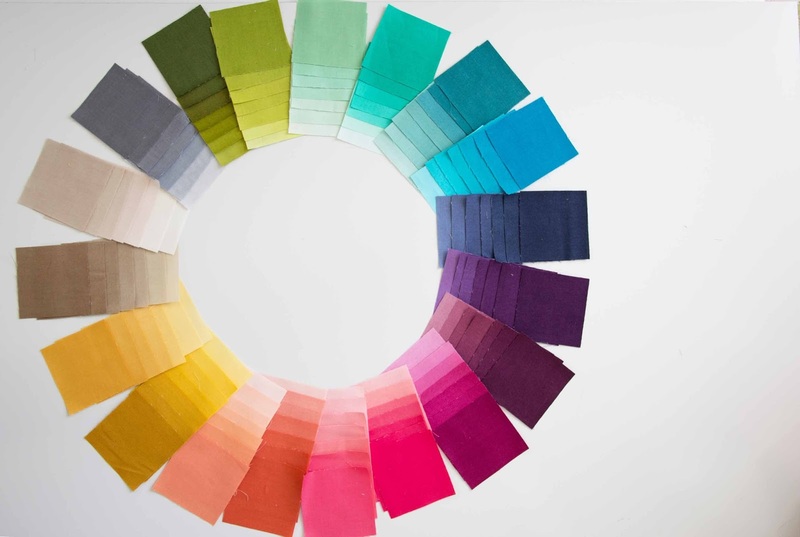 SO many possibilities, and such a need for fabric solids like this. Congrats! I've loved your fabrics since the very beginning! Now I just have more to love! Thanks Vanessa! Love that Secret Garden quilt! 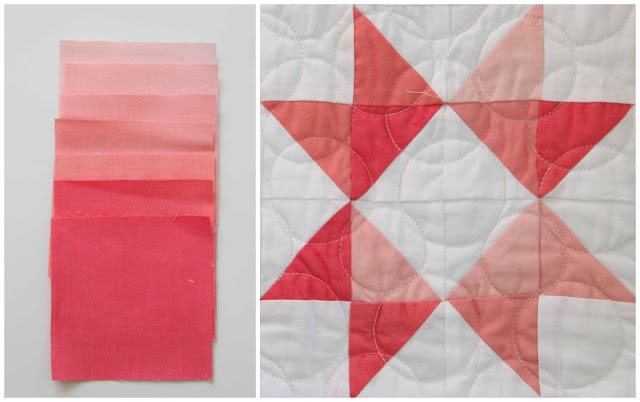 The ombres are wonderful and will add a whole new dimension to all my quilt patterns. Looking forward to experimenting with my favorites to see the effects these shaded fabrics will add!!! Thanks for a chance. Love the ombre fabrics and that beautiful bag pattern! True talent! I don't know where to begin! 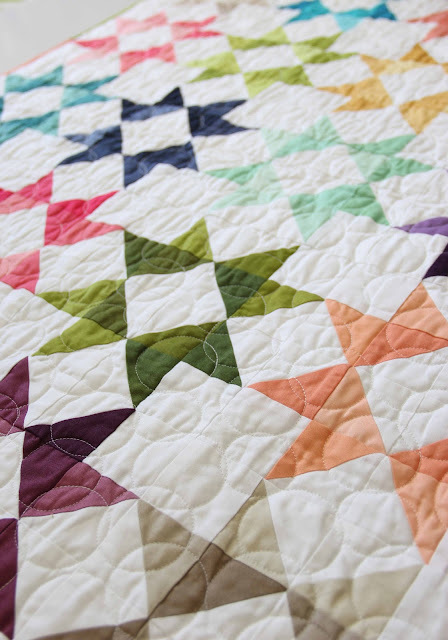 Such gorgeous colors and all the quilts are beautiful! Oh, how exciting! I hope I win, those fabrics are so pretty. Such amazing colors that could be combined in so many ways! I wouldn't know where to begin! I love these! 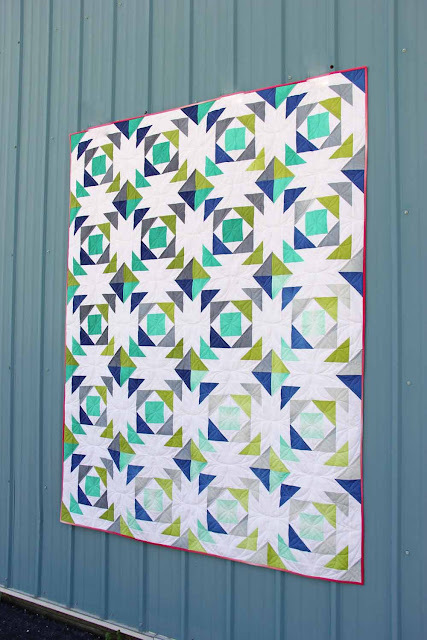 And that new quilt pattern... Criss cross applesauce looks neat! I love Moda'so & I love those. Thank you . Wow! What a great array of colors with so many possibilities! Love these ombres especially the aqua, magenta and mustard. Enjoy a great day, Vanessa!! I've ordered the Simply Color series and I'm anxiously awaiting their arrival. Love the idea of the Ombre fabrics and look forward to seeing the new patterns. So beautiful! This looks like summer all year around! HAPPY DAY! 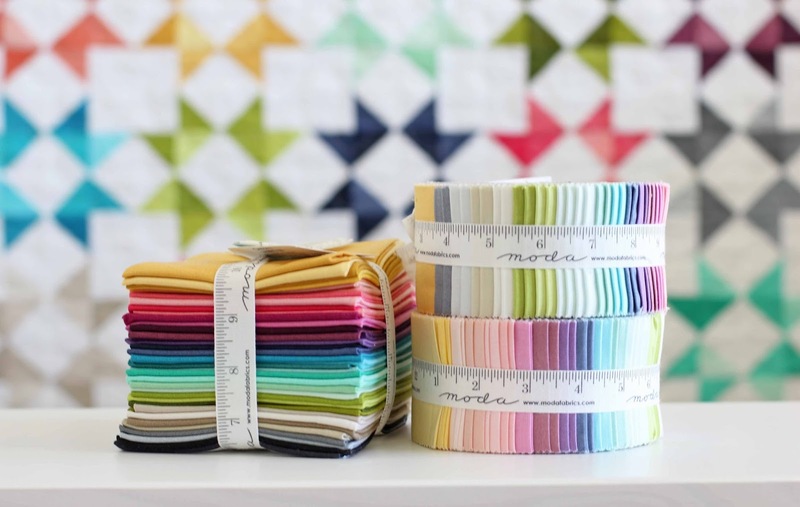 These are going to be so useful to us quilters! Thank You too, for the giveaway! Amazing, just AMAZING! Congratulations. I just wish my fabric shop could carry the whole line. All those projects are GORGEOUS! Beautiful. I would love you win your ombré straps. 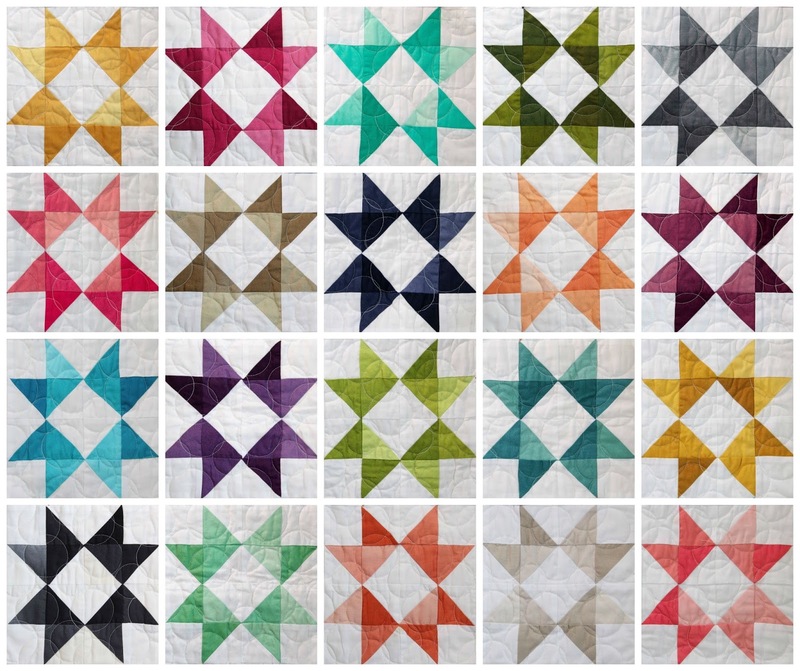 I would make them into churn dash quilt. That would be super beautiful. Thanks for the opportunity. 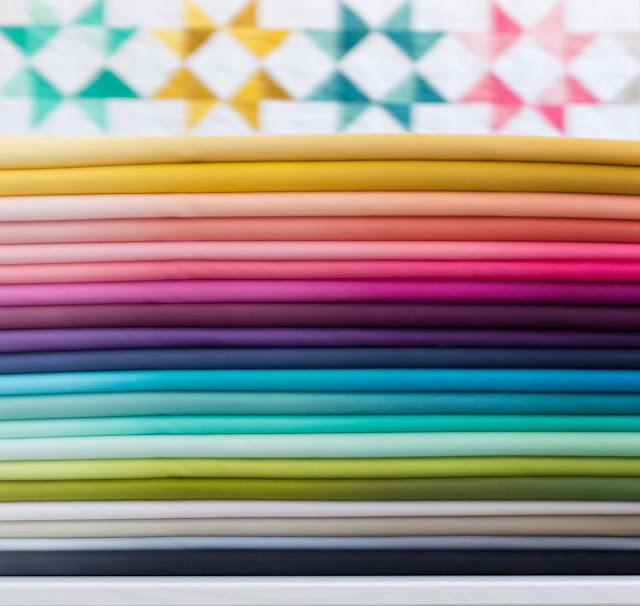 I absolutely love every one of these ombre fabrics!!! Beautiful colors! I can't wait until they're in stores. 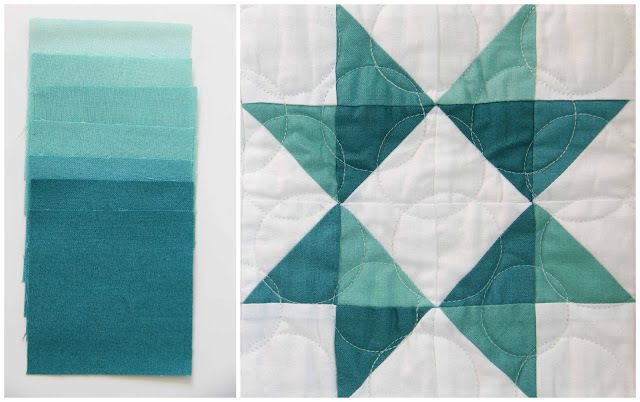 I've been wanting to make an ombre quilt for ages. 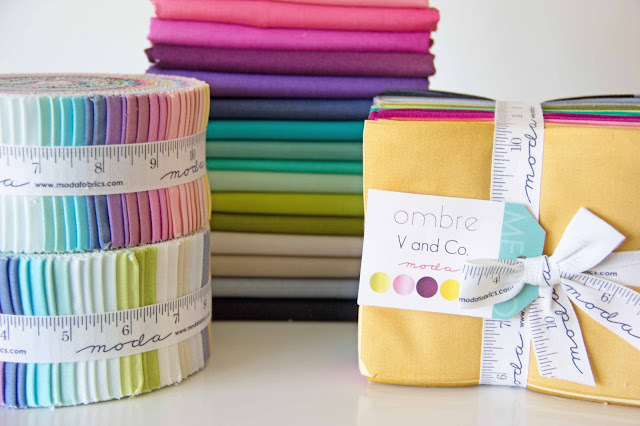 Can't wait to see more patterns for the beautiful Ombre fabrics! Amazing! These will be so fun to work with! No wonder you're excited! And kudos to you for keeping it under wraps like you did, I wouldn't be able to do it!! :) I LOVE ombre & quite thankful my birthday is soon! 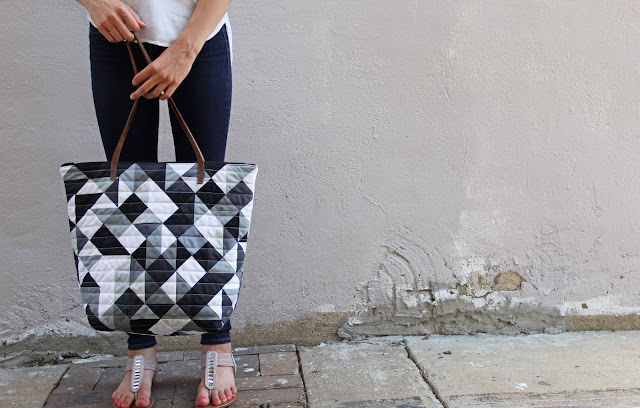 The geometric tote is catching my eye.....adorable! Your fabrics are just beautiful and you put so much thought into all you do. I love your Endless Summer pattern and fabrics. As always the colours are gorgeous! Thanks for the chance to win.